The Two images above show a wide contrast in what they are promoting, the style of illustration and the choice of type. The first advertising image is by Shumacher & Ettlinger and was created to promote “The Uncle Sam Range” cookers but yet this isn't that obvious when you first look at the piece. The piece deals with more controversial subjects such as race, wealth and the overpowering of the United States. Underneath this the second of work is a poster by Saville Lumley advertising the necessity of men at the time to join the army and fight in the Great war. Although this seems quite obvious there are additional factors of the poster which expose the message much deeper. 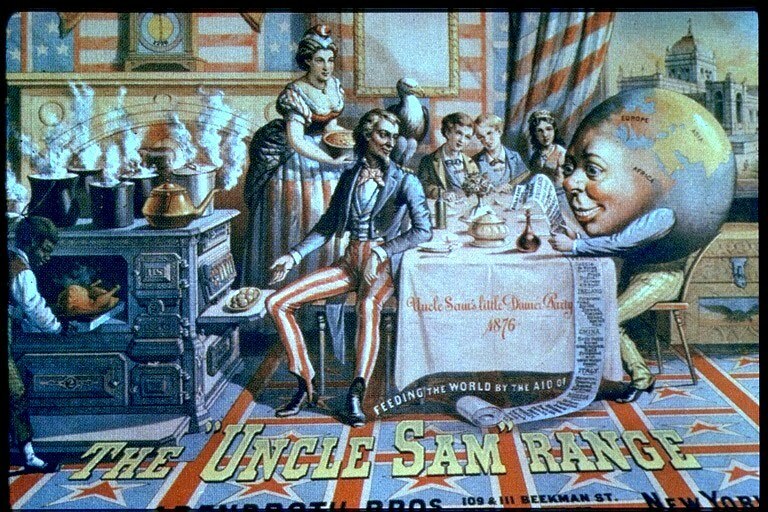 In the first poster the face of America “Uncle Sam” is sat with an eagle on his shoulder looking at the globe to his right who is writing a menu of food for all the other countries in the world. Unlike the United states the other countries aren't treated with as much class and are left with the less luxurious foods on the menu, this represents how the U.S wanted to rise above the rest of the world and be all in power. 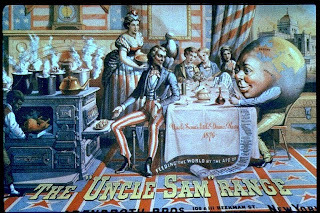 The red, white and blue colours are repeated across the image to link in with the noble representation of the U.S, in the foreground the words “The Uncle Sam Range” are printed in a traditional western style font in a gold pigment to elaborate on the royalty of owning one of the cookers would be. 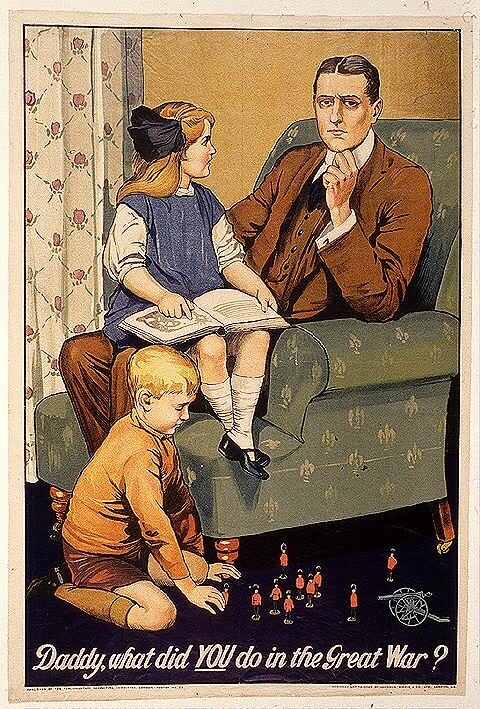 Contrary to this the second poster has been created to almost guilt trip its audience, it plays on the fact that the main header at the bottom has come from a child because this is something a lot of men at the time with children could relate to. The line “Daddy, what did YOU do in the Great war” plays in the readers mind, almost expressing that if they didn’t join the war they would have nothing to tell their children, adding to this the word “you” is is bold underlined capitals so it sticks in your mind. The composition of both pieces is very similar, arranged with people interacting and looking at one another, however I think that this composition is much more important in Savilles poster. On the right hand side the Father figure is gazing into the distance whilst his daughter reads a book on his knee, his daughter appears lost that the father figure doesn’t seem to be interacting with her. The emotion in his face builds up on the sense of guilt to the audience. On the floor the son is playing with toy soldiers linking back to the Great war. Having the child on the floor playing with soldiers could show that he looks up to his father and that if he didn’t join the war then his son wouldn’t have an idol to look up to. Both posters have one main factor in common that they play on their audience twisting their views and promoting almost subliminally with their composition and layout.